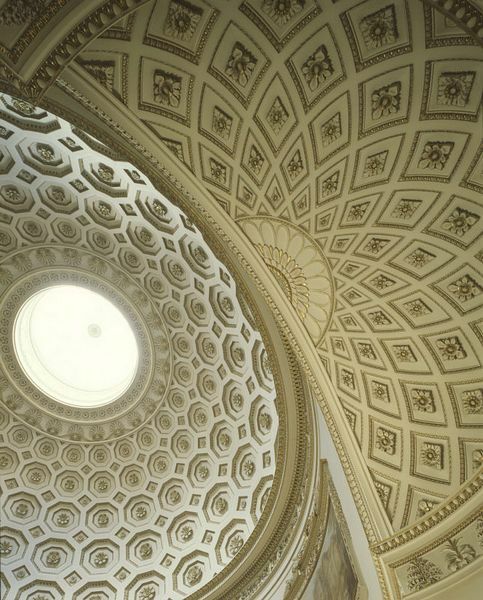 Fans of 18th century architect, Robert Adam, are in for a treat at Kedleston Hall. 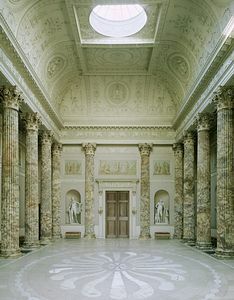 The interior designs of this Palladian mansion have some of the best examples of Adam's work and have seen very little alteration since they were completed in 1765. His Italian-influenced Marble Hall is straight from one of the palazzos of Rome, with its lavish use of marble, statues and an ornately decorative ceiling. It continues to make a grand first impression of the house, as it was intended to. The five lakes on the estate were also designed by Robert Adam, along with various walks and outbuildings. As visitors enter the park they will pass over the splendid Adam-designed bridge. history dating back to the 12th century when the Curzon family arrived in Derbyshire. 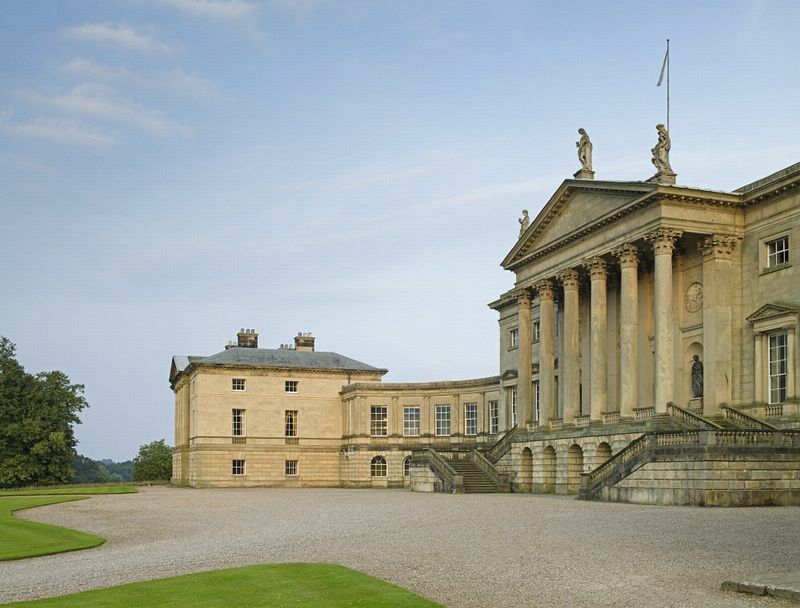 The existing neo-classical mansion was built for the first Lord Scarsdale and was the joint effort of Matthew Brettingham who created the initial design, Jame Paine and Robert Adam who completed the magnificent building and grounds. 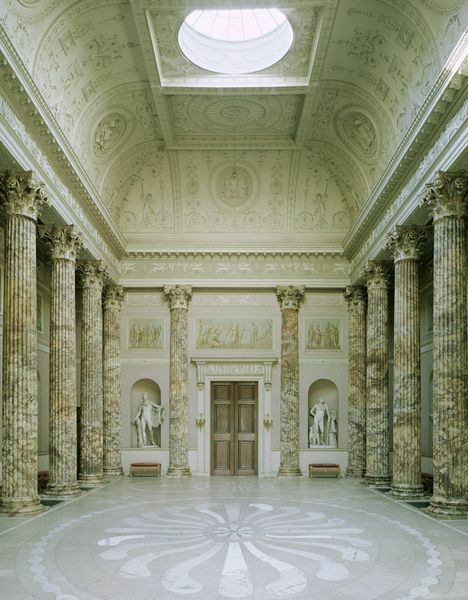 A tour of the Hall will reveal the Marble Hall along with the grand state rooms. The blue and gold drawing room shimmers with opulent décor and the ceiling celebrates sea monsters and mythical mermaids to match the sofas. The Saloon's domed ceiling was again Robert Adam's work and was built to display Sir Nathaniel's impressive collection of sculptures, now replaced by classical urns. Note the sofas and chairs all have curved backs to sit perfectly against the curved walls. Throughout the house there is a fine collection of artwork and antique furniture. Many of the furnishings were collected by Lord Curzon when he held the position of Viceroy of India between 1899 and 1905.
and fascinating objects from India and Asia during colonial times. One of the museum's highlights is Lady Curzon's peacock dress from the early 1900s. As was the fashion in Victorian England, the gardens were designed as a "Pleasure Ground". The sunken ditch or "ha-ha" gives uninterrupted views from the house across the farmland and estate while keeping the livestock in the open fields. Further exploration of the estate will reveal the Orangery and summer house. Such were the powers of the family that in 1757 the original village of Kedleston was relocated 2km down the road, leaving only the small 13th century village church of All Saints in situ. The historic church is also worth a visit, if only to see the ornate marble tomb of Lord Curzon and his first wife. 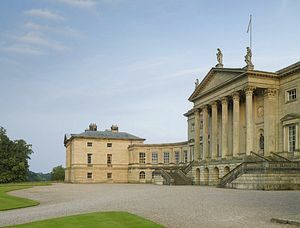 The grounds of Kedleston Hall cover 820 acres. There are several long walks along maintained trails. The lakes are home to many species of waterbirds and the boat houses and fishing room are available to tour, having been recently renovated by the National Trust.